They'd been driving on paved roads for days. Some stretches of the road were pristine, as if a road crew had been there only hours before. Other stretches were covered with wide jigsaw cracks and potholes the size of canyons. Now the car sat idle before a barricade of black and yellow stripes. A bold Bridge Out sign made it clear they would go no further. 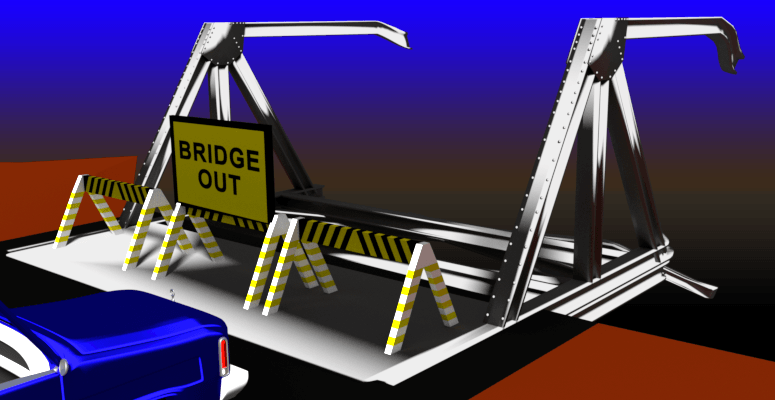 "If the bridge is over a river," Eddie suggested, "we can cross it with your car." "I already checked," Bryce said. He stood outside, leaning against his door. "We won't be crossing that." Bryce ran a hand over his scalp. "See for yourself. I'll try feeding our prisoner." Eddie climbed out of the car. Kai was there beside the road, munching a piece of mutton jerky, a can of Mountain Sunrise in her tiny hand. She stared out at the gap in the landscape ahead. 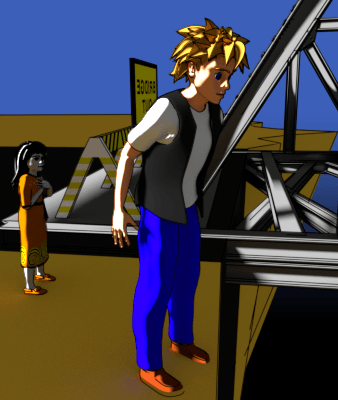 As Eddie stumbled towards the bridge, Kai gripped his right hand. "Careful," she muttered around her mouthful. "It's deep." The road ended at a series of twisted beams that had once been part of a bridge. Beyond was a deep gorge fifty feet wide, stretching in a twisting line that disappeared in the distant hills to the north and south. Eddie leaned forward to peer down into the chasm. The bottom was swallowed in shadow. Eddie couldn't tell if it was a hundred feet deep or a mile. The dragon rider's curses drew Eddie's attention away from the abyss. Bryce stood at the back of the car, the trunk open before him. He struggled, then swore and slammed the trunk closed. "He doesn't like sunlight," Eddie reminded him. "He's a goddamn vampire is what he is. I wasted a perfectly good can of soda trying to offer it to him. It's all over the place." "I think we'll manage without it." "So what do we do now?" Bryce said, approaching the chasm. "There was a crossroads about a mile back, but it doesn't look like there's any place nearby to cross." "Do you think you can jump it?" Bryce glared at him. "Are you insane?" "Maybe your car can fly." "How badly do you want to find out?" "Well..." Eddie thought about it. "Maybe... you could use magic to cross it." "Kardhoom thought you had what it takes to use magic. You could use the mayor's magic staff and make it fly." "Huh! I don't think so." "But don't you think it's worth trying?" "Man. I'm not going to make a fool of myself." "There's no one here to think you're foolish." Bryce sighed. "Fine, what do I do?" Eddie considered this. "According to Tim, magic is all about focus and willpower and spark. We know you've got the spark, so it's only a matter of thinking about the car flying." "Think about the car flying," Bryce repeated flatly. 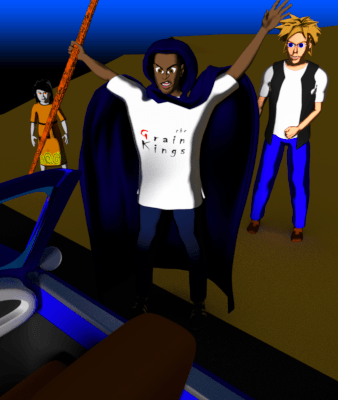 A minute later, Bryce stood beside the car wearing the mayor's cloak, the staff held up. "So, I do what? Imagine the car in the air?" Bryce closed his eyes, both hands held out, the staff extended beside him. A minute passed. "Say something that sounds magic." "Sure. Now pretend you're lifting the car with your mind." Bryce's eyes closed, his brow furrowed in concentration. He grit his teeth. The car's horn sounded in a long, piercing honk. It did not stop when Bryce dropped his hands and gaped at it. His disappointment didn't dampen Eddie's excitement. "It worked. You did something." "I made the damn horn honk," Bryce exclaimed, shouting over the noise of the horn. Kai held her hands over her ears, watching with mild irritation. "Try to stop it," Eddie said. "Do it with your mind." Bryce grimaced and closed his eyes again. He held his hands up. The windshield wipers engaged at full speed. "Dammit," Bryce shouted. He stomped towards the car. He flicked the wiper controls, then beat on the steering wheel. After a moment, the horn stopped. "Hmm," Eddie mused. "Not exactly what we were going for." He knelt beside Kai. "Do you know magic?" "Magic," she repeated. "You mean like witches?" "No, good magic. Do you know how to make something fly?" "Okay, well have you ever made anything fly?" "I can make a bird fly." Eddie frowned. "That's great. Good." He stood up and wandered back to the remnants of the bridge. He leaned over the edge and looked down. Darkness, as far along the chasm as he could see. As he searched the abyss, he noticed something to the left, extending between the two sides of the gorge. It was too dark to be certain, but he thought it might be a road, leading into an arched opening on the far side of the chasm. Bryce jogged up to him and followed his gaze. "Where?" Bryce studied the distant passage. "That's got to be at least fifty feet down." "So if we can find a way down there, we can get across." "Huh! If you say so." Bryce shrugged. "Back to the crossroads I guess." The crossroads was a mile back the way they'd co/me. Bryce passed it and turned so they could see the road sign. "What's a SIT?" Eddie asked. "Beats me, but it's crossed out." "Maybe it leads to that road we saw." "We should at least check it out." The road to the north was little more than gravel with islands of crumbling asphalt. Bryce eased his car around the pitfalls. As they drove, Eddie checked his phone. He'd been doing this every half hour for the past day. He'd left Ruby several text messages in that time, hoping she was okay. She'd disconnected from him rather abruptly nights before, and he feared something bad had happened. "Looking for messages from your girlfriend?" Bryce asked. "I wouldn't say she's my—"
His phone display read One Message. "Yes!" he exclaimed. He clicked the message open. "Who's Winnie," Bryce asked, leaning over to read. Eddie blinked at the message. You are one and I am two? "I have no idea," he replied. "Is Winnie a girl's name? Or is this like Winnie the Pooh?" "Well, why don't you reply?" Eddie keyed in his reply. After a few minutes of slow progress, they reached a leaning, dilapidated sign. The road beside it veered to the left towards a lone hill. "Doesn't look promising," Bryce said. "Look at the state of this road." "We should at least try it." Over the next rise, the tunnel came into view. A concrete arch, stamped with elaborate vine patterns framed the entrance. Chunks of concrete debris littered one side of the tunnel. Bryce pulled up to the entrance, stopping beside an empty toll booth. "I'm not going in there," Bryce said, peering into the darkness beyond the arch. "Maybe we'll find a way across on the way to Ur." 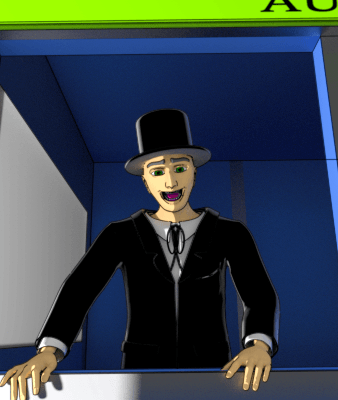 As Bryce threw the car into reverse, a dark shape rose within the toll booth. Eddie nearly cried out with surprise. "Welcome young masters," said the man in the toll booth. He was an old man, his face creased and mottled with liver spots. He wore a crooked black top hat and a suit that would have looked at home on the corpse of a funeral director. Bryce and Eddie stared up at the man. "Uh," Bryce said. "Thank you?" "Welcome to the Subterranean Intercontinental Turnpike," the man said, bowing. "What is your destination?" "It looks messed up. There's no lights inside." "Our maintenance crews are resolving the issues as we speak. I assure you, you will enjoy your journey unimpeded. What is your destination?" "Graden? Good, good. It should take you no time at all. Your passage fee will be twenty dollars." The man's smile faltered. "I beg your pardon?" Bryce turned to Eddie. "What have you got?" Eddie dug out his wallet. "A five." Bryce snatched it and put it together with his own cash. "We got seventeen dollars and..." he dug into his pocket and pulled out change. "...and twenty-seven cents." 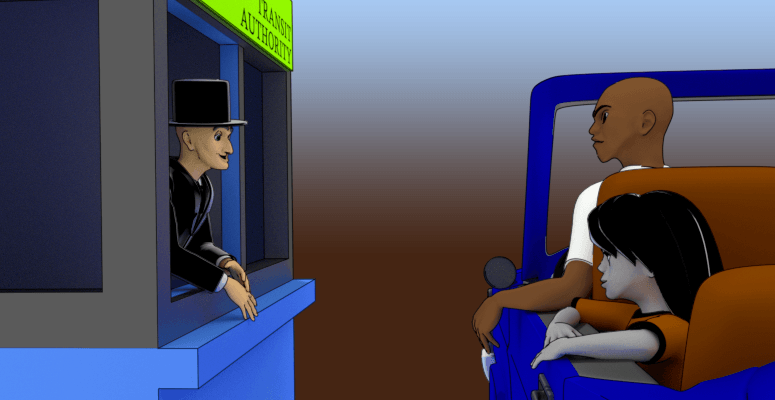 The toll taker stared down at the money, his theatrical smile now gone. "You wouldn't have that in coin, would you?" Bryce reached back past Kai, popped the drink cooler open and pulled out two cans of Mountain Sunrise. "How about seventeen twenty-seven and two cans of soda." The toll taker's eyes widened with obvious excitement. He reached for the bounty, but Bryce drew it back. "You aren't conning us, are you? We can get through to Graden this way? Because if we get halfway down this tunnel and it's blocked off, I'm coming back for this." The man's smile returned. "Of course, sir. I guarantee that won't be necessary." Bryce studied him a moment. He dropped the money into the toll taker's hands, followed by the two cans. "Thank you sir. Have a good day, sir." Bryce grumbled a reply and eased the car forward. As they drove into the tunnel, Eddie took one last look at his phone. A new message had appeared.